Before you spend big bucks on one of the many Maui helicopter tours, you need to find out if it's worth it. This is your unbiased insider's review and virtual preview of what it's like to live the high life and see sights you'll never see on the ground. So I'll just cut to the chase right now and tell you that in all honesty, our helicopter tour of Maui with Sunshine Helicopters ended being one of our favourite things to do in Maui! Sure, it was one of the more expensive activities on our vacation, but we ended up being SO glad that we went for it! 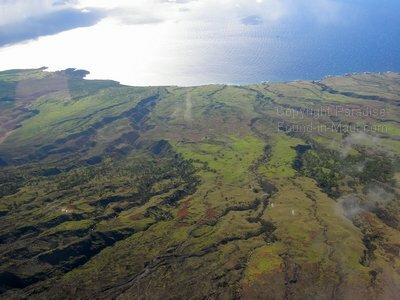 Most of Maui is inaccessible, except by air, so if you take a helicopter tour, you'll see things that would literally have been impossible to access via ground. To check in, you have to head for the Heliport in Kahului - it's pretty much right next door to Kahului Airport, where most visitors first step foot on the island. And then you'll see your helicopter arrive. Big breath. Glory awaits! Your ride is waiting for you! 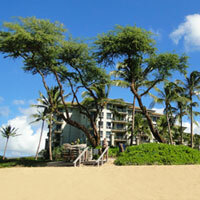 There are tons of Maui helicopter tours to choose from. 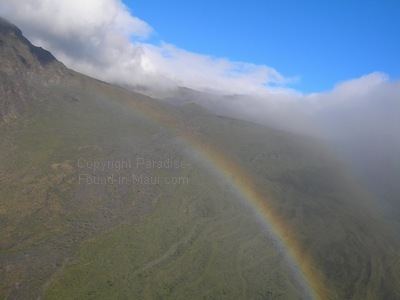 We chose Sunshine Helicopter and their tour of East Maui that included, among other things, Mt. Haleakala, and the lush jungles surrounding the town of Hana, Maui. So how about I show you some photos from our ride? The first thing you'll fly over is the sugar cane fields - you can't miss them - the irregular rectangular fields really stand out from the air! Now don't worry, it gets more exciting than this. The sugar cane fields are just a warm up. We climbed higher and higher as we flew towards Mt. Haleakala at last we reached the summit, where we were treated to a magnificent view of the crater. 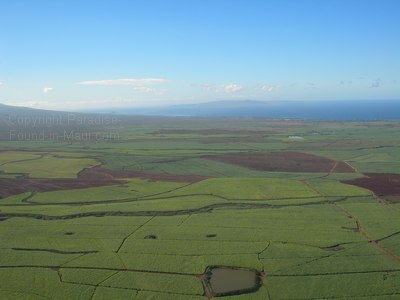 As our helicopter tour of Maui took us away from Mt. Haleakala, we passed through the ethereal clouds that tended to congregate here. Rainforest seen through the mist. Remnants of lava flows that carved huge channels into the earth. It is amazing to see so clearly how the rivers of lava from eons ago left their marks on the land as they flowed towards the ocean. Seeing these beautiful views from the air is one of those things to do in Maui that everyone should get a chance to experience! By this point, we were confident that spending our money on one of the Maui helicopter tours was the right move. How else would we get to see views like these? 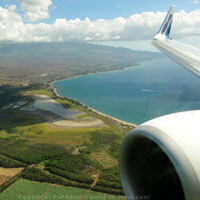 Once we reached Hana, we followed the Northern coast of Maui as we headed back to Kahului heliport. 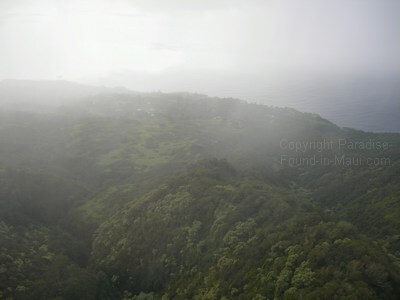 The coast here offered up magnificent views of the famed road to Hana, Maui. We were also treated to more views of Maui's lush jungles and waterfalls. Even if you don't normally get motion sick, consider taking some motion sickness medication before your flight. I NEVER get motion sick on airplanes or boats, yet to my surprise and dismay, I DID get quite queasy on our helicopter tour of Maui. This could have been prevented if I'd taken some motion sickness medication ahead of time. On the other hand, my husband was lucky, and experienced no queasiness whatsoever! 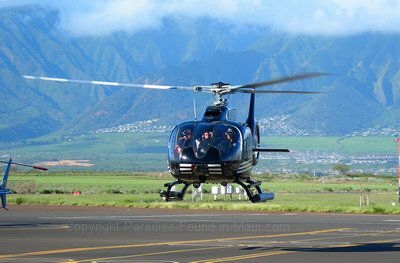 If you're interested in going on a helicopter tour of Maui like we did, you can get more information on Maui helicopter tours pricing and reservations on the Barefoot Tours site. 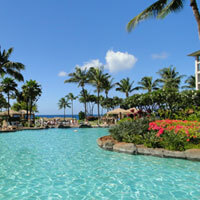 When you get to their site, scroll down until you see the link for Maui. Click on it. Then scroll down until you see "Helicopter Tours" All of your ticketing options will be laid out for you there.